Most products bound for the export market arrive in Portland by rail, Statz said, but two-thirds of the soft white wheat arrives by barge. The up-river elevator and barge system on the Columbia and Snake rivers is cheaper and more reliable than rail, he said. PORTLAND -- Wheat yields and protein levels should return to normal in the Pacific Northwest this summer after a couple dry, hot years, the Oregon Wheat Commission chief executive told international buyers. Speaking at the Latin American and Caribbean Wheat Buyers Conference, hosted by U.S. Wheat Associates, Blake Rowe explained the region's standards for the soft white wheat it exports to the world. Rowe said soft white varieties have to attain good yields, mill well, stand up to weather stress and resist diseases and pests. "A good wheat variety has to have all of them or it doesn't pass our test for what constitutes a good variety," he said during a June 23 presentation. More than 70 buyers and milling and bakery representatives attended the conference in Portland. Attendees came from Mexico, Brazil, Chile, Colombia, Guatemala, Venezuela, Peru and elsewhere throughout Central and South America, plus Haiti and Trinidad and Tobago. Pacific Northwest growers primarily export wheat to Asia, but hope to expand sales in Latin America. To that end, Northwest and U.S. wheat officials escorted the international buyers on tours of the Wheat Marketing Center in Portland, which provides product testing and development, to an export grain elevator and a seed plant, and to the Columbia Basin wheat farm of Darren Padget, chair of the Oregon Wheat Commission. The body of the conference, held in downtown Portland, included multiple presentations on topics ranging from transportation and pricing issues to wheat breeding and blending trends. Rowe, the Oregon Wheat Commission CEO, described the process by which new soft white wheat varieties are introduced in the region. He said the benchmark is the Stevens variety which, although not widely grown now, is well known in the region. It's grown in test plots alongside new varieties to eliminate field differences, and new varieties are given a score based on grain, milling and baking quality compared to Stevens. Those scores are used to rank varieties as most desirable, desirable, acceptable or least desirable, Rowe said. The scores are published each year so growers can choose what to plant. A high percentage of Pacific Northwest growers use certified seed, Rowe said. Growers aim to produce wheat that will be acceptable to the most sensitive markets. "For us, those are Japan, Korea and Taiwan," Rowe said. "They have the toughest standards to meet." Rowe said regional grain elevators test wheat on arrival from growers and separate it by protein levels. Generally, Pacific Rim customers want low protein levels in the soft white wheat they mill for crackers, cookies, noodles and other products. Ryan Statz, a merchant with Columbia Grain Inc. in Portland, told the buyers how wheat and other crops move through the company's export facility. 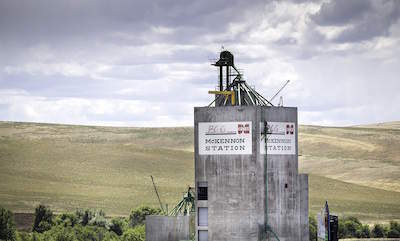 The company has about 60 elevators throughout the Pacific Northwest, Midwest and into Montana, and has a combined storage capacity of 1.3 million metric tons. In addition to wheat, Columbia Grain exports corn, soybeans, peas, canola and other crops, Statz said. "We service some of the most quality driven buyers on the planet," he said. Most products bound for the export market arrive in Portland by rail, Statz said, but two-thirds of the soft white wheat arrives by barge. The up-river elevator and barge system on the Columbia and Snake rivers is cheaper and more reliable than rail, he said. "Following up-river loading, we can estimate almost to the hour when it will be in Portland," Statz said. Statz said the Columbia and Snake system will be shut down from Dec. 12 to March 20 for 14 weeks of lock repairs and upgrades. There will be no barge traffic during that time, meaning supplies will be hampered and prices likely will be higher, he acknowledged. But he said the repairs are "absolutely necessary" and represent a "short term loss and a long term gain." Overall, Statz said many in the business expect a much larger wheat crop this year with a good range of protein levels due to nearly ideal planting and growing conditions. Experts forecast lower prices, which could help U.S. exports compete. But he said Australia, Canada and Russia also appear to have good crops this year. Other speakers included Glen Weaver, a research fellow with Ardent Mills. The company formed in 2013 as a joint venture of Cargill, ConAgra Foods and CHS Inc.
Weaver walked the audience through a food security "reality check" of the next 34 years, with the world population projected to reach 9.6 billion by 2050. Water, land, chemical use, food safety and a distrust of big science and big ag are all geopolitical issues, he said. "You're in a very complex business," Weaver reminded the international buyers. Trust and transparency are crucial to agricultural businesses, he said. Consumers are being led by activists, he said, and there's "certainly a lot of chatter going on out there that every company has to be considerate of." "If you want to have a positive impact on how people view you, why not help out the organic sector," Weaver said. If 10 to 15 percent of the population chooses to buy organic products, "it's too big to ignore," he said. Weaver predicted industry will have to "belly up" more to help fund crop research, and government support for such work will decline. That will require an evolving public-private relationship. While the current focus of most crop breeding work is productivity, there will be more emphasis on functional and health traits, he said. Biotech wheat is likely, he said. "Every 10 years I hear it's 10 years out," he said. "As technology evolves, you're gong to see that technology make some changes, definitely in the grain industry. "You have to ask yourself, what is the plan you have to strive for over the next decade or so," Weaver said. "What's next? What's coming around the corner?"